ESA’s planet-defending Hera mission will set a new record in space. The asteroid investigator will not only be the first spacecraft to explore a binary asteroid system – the Didymos pair – but the smaller of these two worldlets, comparable in size to Egypt’s Great Pyramid of Giza, will become the smallest asteroid ever visited. Didymos itself is just 780 meters (approx. 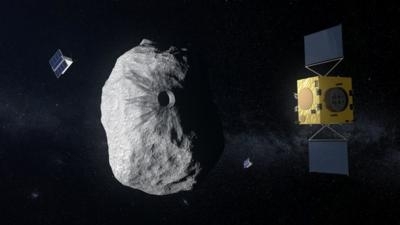 2,560 feet) across – smaller than any asteroid visited by a probe other than the 1,150-foot diameter Itokawa rubble pile visited by Japan’s first Hayabusa spacecraft and the 1,640-foot diameter Bennu, around which NASA’s Osiris-REx mission is currently in orbit. That leaves Didymos’s orbiting moonlet ‘Didymoon’ as the smallest of all asteroids scheduled for robotic inspection, at just 525 feet across. “Didymoon’s miniscule size really becomes clear when you look at other asteroids,” comments Hera’s lead scientist Patrick Michel, CNRS Director of Research of France’s Côte d'Azur Observatory. Didymoon is very relevant for such testing as it is in the riskiest class of near-Earth asteroids because of its size: larger bodies can more easily be tracked, smaller bodies will burn up or do limited damage, while a Didymoon-sized impactor could devastate an entire region of our planet. The Didymos system is also attractive in terms of bonus science, offering insight into the formation of the binaries that make up around 15% of known asteroids. “Didymos is spinning very swiftly, rotating once every two hours,” says Patrick. “Around its equator, its weak pull of gravity could be overcome by centrifugal force, potentially leading to material rising from the surface – the leading theory of where Didymoon came from. So landing on the equator would be impossible; you would have to touch down near its poles instead. Patrick suggests Didymoon-class objects may additionally prove optimal for planned asteroid mining: larger bodies are comparatively rarer, while their smaller equivalents are more prone to fast spinning – caused by gradual warming due to sunlight. Hera is currently under study to be presented for approval by ESA’s Space19+ Council meeting of European space ministers. It is planned for launch in 2023. Hera would be ESA’s next mission to a small body after the Rosetta comet-chaser, benefiting from the expertise acquired during that 12-year mission. Long-term planning is crucial to realise future missions, and to ensure the continued development of innovative technology, inspiring new generations of European scientists and engineers.